Jacki Weaver prepares to plant one on son Sullivan Stapleton in Animal Kingdom. Disc Dish had a chance to speak with actress Jacki Weaver when she was in New York to pick up her prize at the National Board of Review Awards for Best Supporting Actress for her role in the Australian crime drama Animal Kingdom. Disc Dish: You’ve been having quite a year, haven’t you? And we’re only 10 days into it! Jacki Weaver: Oh, yes! I’ve been a part of that big juggernaut they call the American publicity machine. I’ve been doing quite a lot of publicity with American journalists since I got the NBR Award in December. DD: Have you been enjoying this part of Animal Kingdom’s journey and the overall reaction the film is getting? JW: I certainly am! I didn’t expect a reaction like this. I first got a taste of it a year ago when it won the Jury Prize at Sundance, but this is beyond anyone’s wildest dreams. It’s actually reassuring to see we were right, because we all thought it was a good film. DD: And that you’re being singled out for your performance must be so satisfying. JW : Of course. The movie came right out of left field at a time that I refer to as the twilight of my career. And I can’t complain about my career — I’ve never been out of work, and I’ve played in many of the great classics in some brilliant roles. But this little film, for it to get me so much attention in America, is unbelievable. DD: Certainly you’re also making some noise in Australia…? JW: In Australia, I’ve been around so long that I’m like a piece of comfortable furniture that they’re not ready to throw out yet. I’ve been acting there for 48 years and been in more than a hundred plays. Some of the [members of the Australian press] are carrying on like I’ve been out of work for years, but that’s not the case. Particularly in regards to working in the theatre. 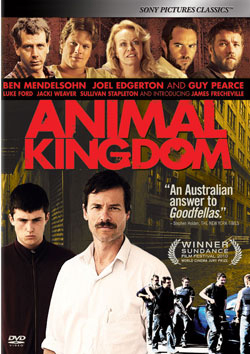 DD: Speaking of which, Animal Kingdom is such a tight little movie, with so much of it taking place in your house. Could you see yourself playing the role of ‘Smurf Cody’ in a stage adaptation of the movie? JW: I’ve never been asked that before! I’ll say yes, of course! I’d be happy to do it again if it was adapted for the stage. I’ve portrayed my share of purely evil and manipulative women on stage before. DD: For me, the film played like I was watching a stage play. JW: Before we started shooting, we had the luxury of a couple of weeks rehearsal, and as a theater actor, I was happy. That gave us a chance to workshop it and get to know each other before we committed it to film. DD: Are you eager to get back on the stage again after the Animal Kingdom excitement has died down, or maybe, for now, some more movies? JW: Oh, either! Or both! Hopefully, I’ll just have more options open to me. Apart from my family, my love is portraying other people. And when you win awards, you get more choices to play more people.